Food marketing really is quite amazing. They can take food that is not all that much better for you than candy and make it seem as if it’s the most wholesome product you could possibly purchase. This is a large part of the problem in terms of the health of US citizens right now. Unfortunately, many people don’t know about true nutrition so they rely on information they read on boxes and bags to assess what they should consume. The problem is that they believe what they read and the marketers know that. Their assessments are incorrect not because what they are reading is incorrect but because it is cleverly misleading. Recently my wife and I were at the grocery store. I told her that I wanted to take a stroll down the cereal aisle. She knew what I wanted to do right away. 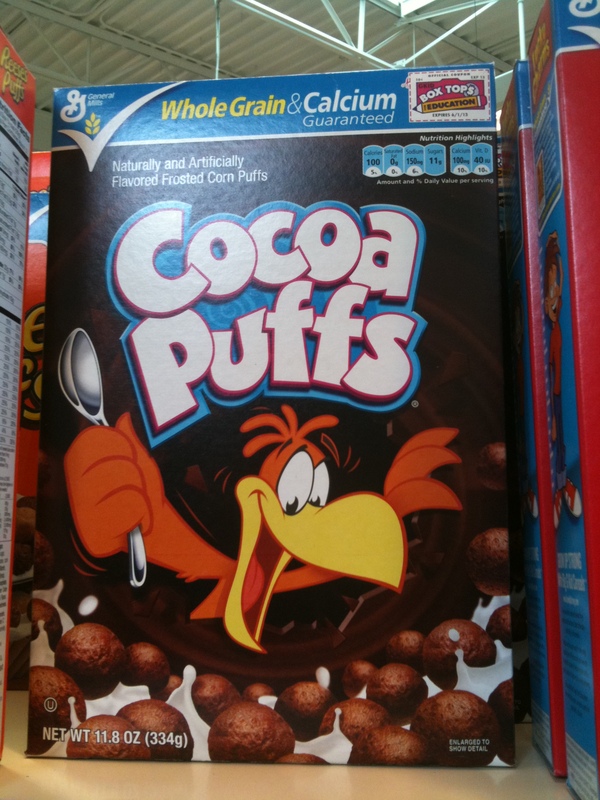 As I strolled down the cereal aisle I took pictures of several different kinds of cereal. Some offenders are worse than others, but none of them are particularly good for you. Cereals tout themselves as healthy in many ways. Some say they are good for your heart. Some claim to provide enough calcium and vitamin D for a whole day (with milk of course). Still others tell you of their whole grain goodness. While they may be telling the truth in those statements they are inherently misleading. 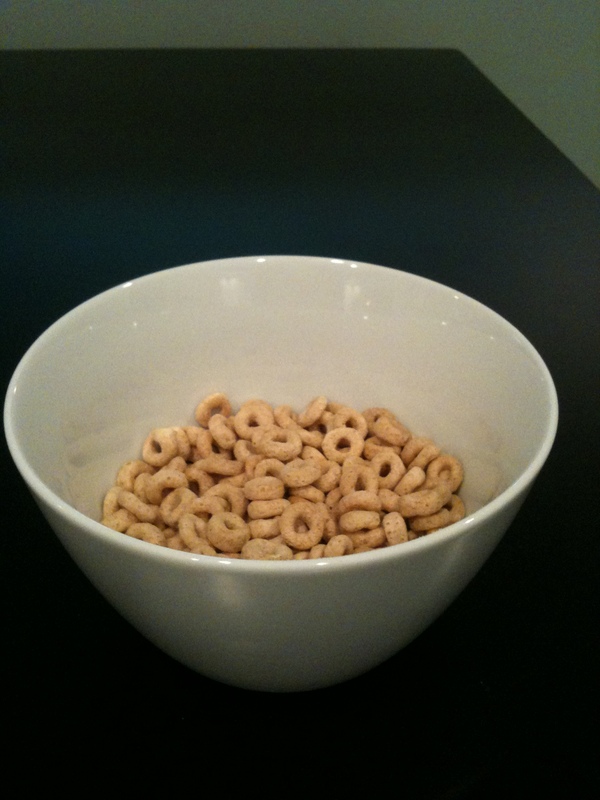 Cheerios does contain whole grain. Other cereals do provide the recommended daily value of calcium and vitamin D. However, that doesn’t mean they are good for you. McDonald’s cheeseburgers might provide enough B12 to satisfy your daily need, but they aren’t health food. 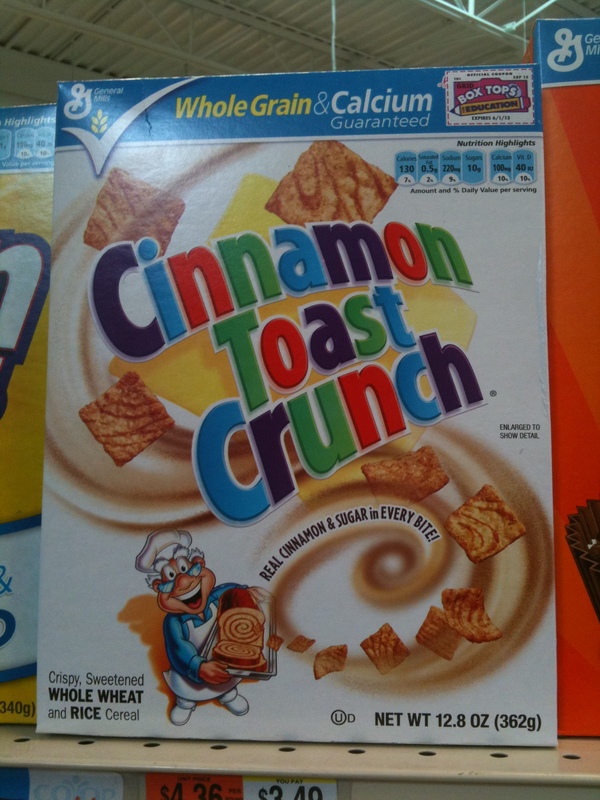 Mmmm…Cinnamon Toast crunch. Sugary goodness. But at the top it says whole grain and calcium guaranteed! Consumers see this and it triggers an automatic response in their brains. “Whole grains and calcium are good for me,” says the consumer. But is a sugary cereal like this actually healthy? I think not. Let’s continue. This one also promises whole grains. 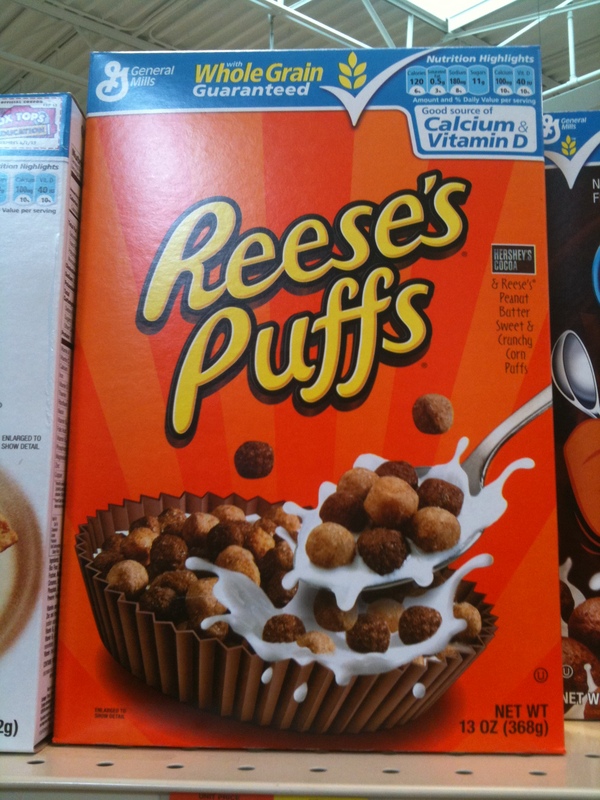 It doesn’t go as far as guaranteeing calcium or vitamin D but does say that it’s a “good source.” Reese’s Puffs are nothing more than a cereal version of candy. 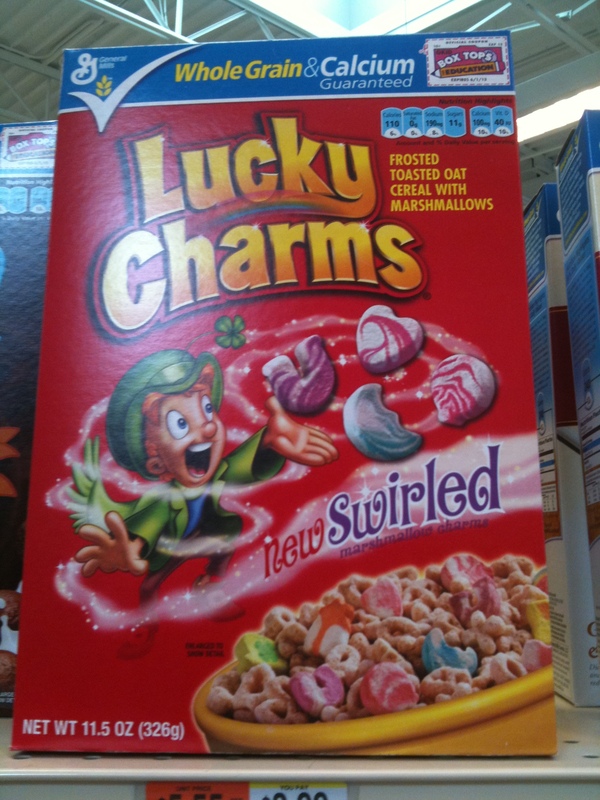 Marketers know that these cereals appeal to children because they taste like the candy. Guess what? They’re about as healthy as the candy too. This too guarantees whole grains and calcium. It also sneaks in the word ‘naturally’ on the box. See it in the upper left corner? Forget the fact that it says ‘artificially’ there too. Marketing geniuses know you don’t actually see that word. All you see if the natural part. Our brains are designed to scan for important information by reading only the first word or two to get the gist of what it says They know that when you read that box all your brain sees is ‘naturally’ and it equates that with healthy. Ahhh, Lucky Charms. Using a character to get to children. This is one of the classics. They also make the claim about calcium and whole grains. Most of this cereal is sugar. I mean, it has marshmallows in it for goodness sake. 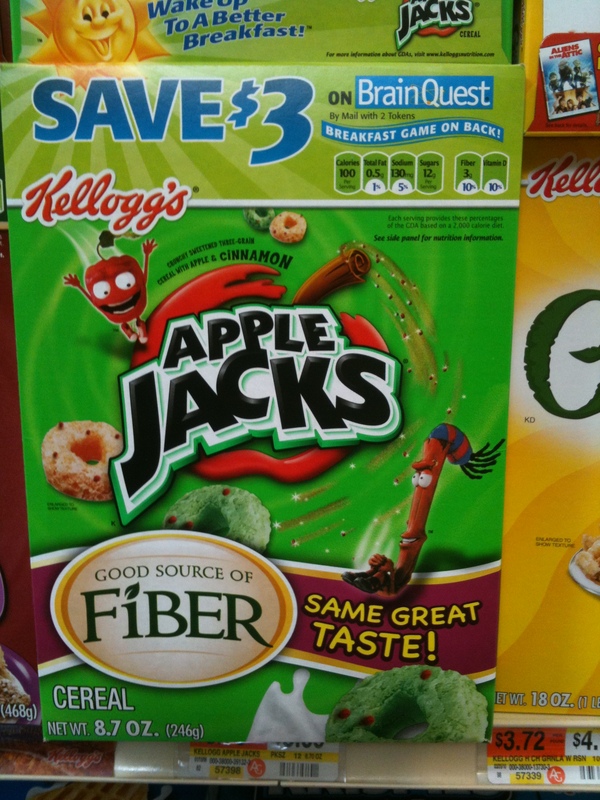 All this claims is that it is a ‘good source of fiber.’ It must be really bad for you if that’s all they could come up with. While Cheerios are probably the least offensive on this list, they still aren’t good for you. This one cleverly designs a heart shaped bowl to hold their cereal indicating that it’s good for the heart. It also claims it can help lower cholesterol which certainly would be appealing to some people. 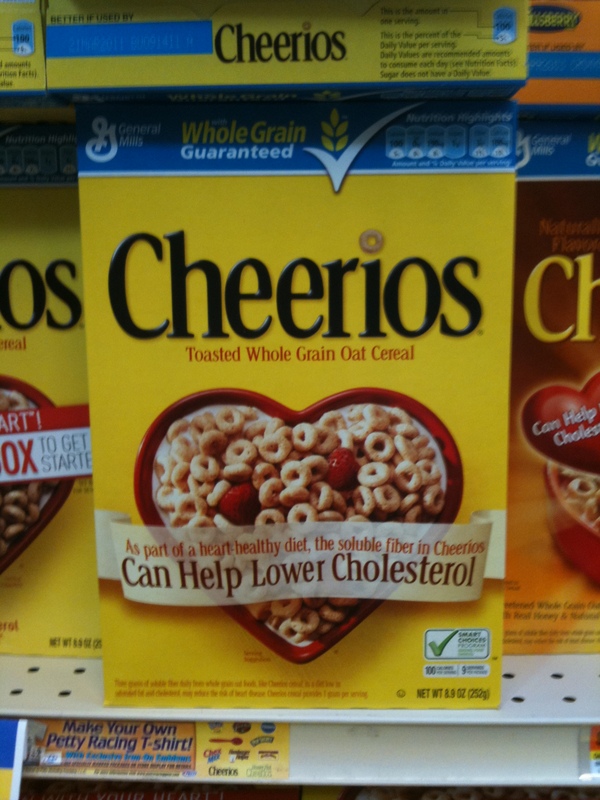 The problem is eating Cheerios alone is not enough to lower cholesterol. You need other factors to do so. I took a peak at the nutritional information for Cheerios as well. I found that it contains 20g of carbohydrate but actually 26 grams are consumed if you have your cereal with milk (and who doesn’t). Twenty-six grams of carbohydrate is equal to more than 5 teaspoons of sugar! Would you eat that for breakfast? I hope not. This is also per serving of cereal. One serving is just one cup of cereal. Not sure what that looks like? I have a little perspective for you. 1 cup of cereal in a bowl. It's a little hard to tell just how much is in there, but it's not a lot. 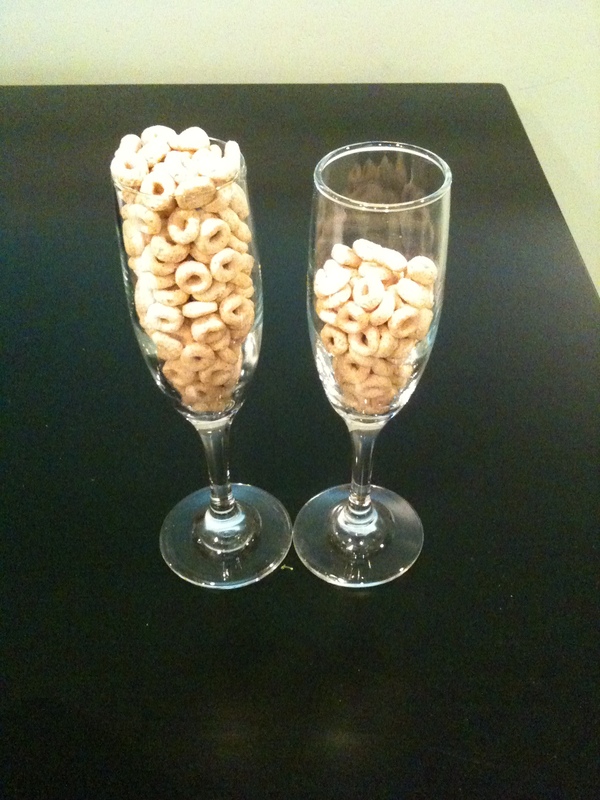 For a little more perspective, this is the same cereal poured into two very small champagne flutes. It doesn't even fill both of them! Most people do not eat just one cup of cereal. They fill up there bowl and add some milk. Kids and adults are likely getting twice what it says on the back of the boxes because they don’t know what a cup looks like. It is obviously not a lot of food. If you eat 2 cups instead of 1, it’s like consuming 10 teaspoons of sugar for breakfast. That’s more sugar than a soda! Disturbing isn’t it? As healthy as the marketing people make it seem, cereal is not a health food. It should be consumed on rare occasions, if at all. I recommend that my patients consume nutrient dense eggs for breakfast. They have lots of good vitamins in them, and are a good source of protein and healthy fats. The cereals are enticing because they appear to be healthy with all the claims on the front of the boxes. Don’t be fooled by the clever marketing. Eating a sugary cereal truly is no better than drinking a soda or eating a candy bar for your first meal of the day. So you’re saying that all carbohydrate sources are equal to their gram weight equivalent of pure sugar? In a weight for weight type of a comparison, no. If we consider how our bodies process carbohydrates and our body’s insulin response, 5 grams of carbohydrate (regardless of source) is equal to the insulin response one would get by ingesting one teaspoon of sugar. After all, carbohydrates are actually just complex sugars. I hope that answers your question.